Everyone, I mean everyone has to make this dessert. I got this recipe from a member of a food group I am in. He posted a picture of the dessert and I immediately knew I had to try it. So I did, the very next day. I am so glad I did. The pannacotta it is just set, it is wobbily, it is silky smooth, it really just melts in your mouth. And the berry compote, it is truly, truly delicious. And the two together, bliss, so delicious, it really is a special dessert. This is so easy to make, it would be amazing as a dessert at any dinner party, your guests will ask for the recipe, they will think you put in a lot of effort and yet it is so simple and not only looks beautiful the flavour matches the beauty. The compote flavour can be adjusted, for instance I decreased the amount of sugar from the original recipe. I also increased the amount of lemon juice. I have also at times added freshly squeezed orange juice. You could even use limes instead of lemons. You need to balance the flavours as they suit you. 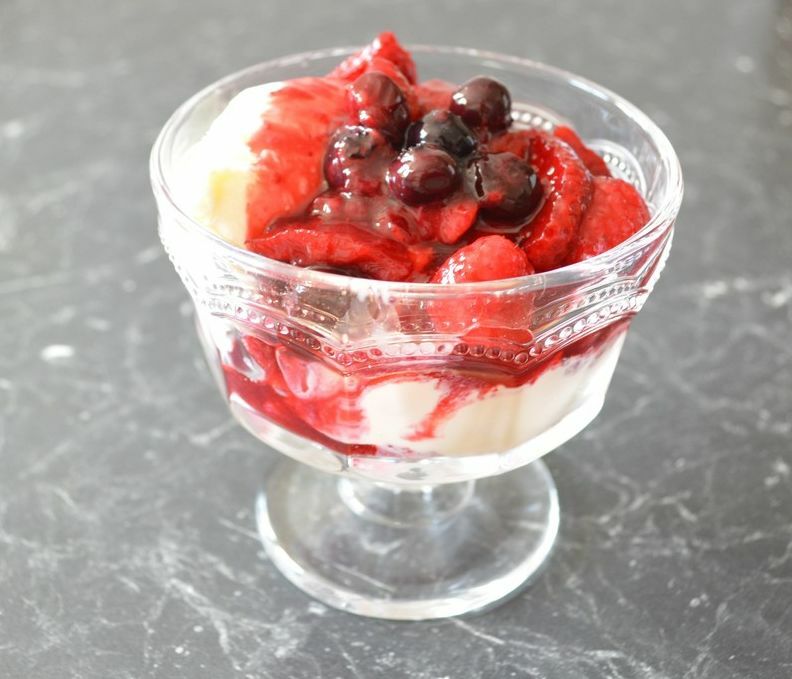 I always double the berry compote recipe and any leftovers is amazing over vanilla ice cream. It is truly the best ice cream topping ever. Forget store bought strawberry topping, this is what you need to have over ice cream. Even just the compote over ice cream is a perfect summer dessert. ​So please if you have a spare 30 minutes, as that is the maximum time it will take to throw this together, make this, you will love it. Place the milk into a large saucepan, sprinkle over the gelatine, let it sit for 3 minutes, to bloom. Add the cream, sugar, vanilla, peeled strips of lemon rind and salt. Heat gently over medium-low heat, stirring, frequently to dissolve the sugar. Do not allow the cream to come to the boil, you want it only heated enough to dissolve the sugar and gelatine. Once the gelatine has dissolved, and the mixture has thickened slightly, take off the heat. Remove the lemon strips. Whisk in the sour cream, until you have a smooth, creamy pannacotta. I like to use a funnel, to stop making a mess to the sides of the glasses. 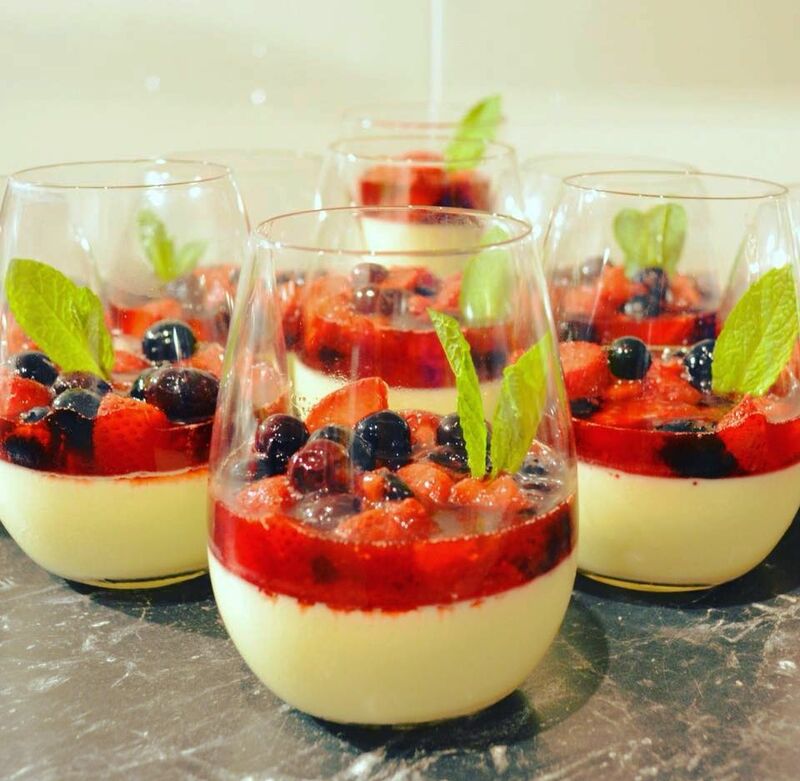 Carefully pour the pannacotta into your serving glasses and refrigerate about 4-6 hours, until set. Berry Compote: Add 1 cup of the berries, lemon juice and sugar to a medium saucepan. Mix until the sugar has dissolved. Bring to a simmer, continue at a low simmer until the fruit breaks down and a syrup has formed, it doesn't take long. Here you need to taste the liquid, if too sweet add more lemon juice, if too tart, add more sugar. Add the remaining 1 cup of berries, mix it through. Pour the mixture into a bowl and refrigerate until cold. Just before serving, carefully pour the syrup onto the set pannacottas.